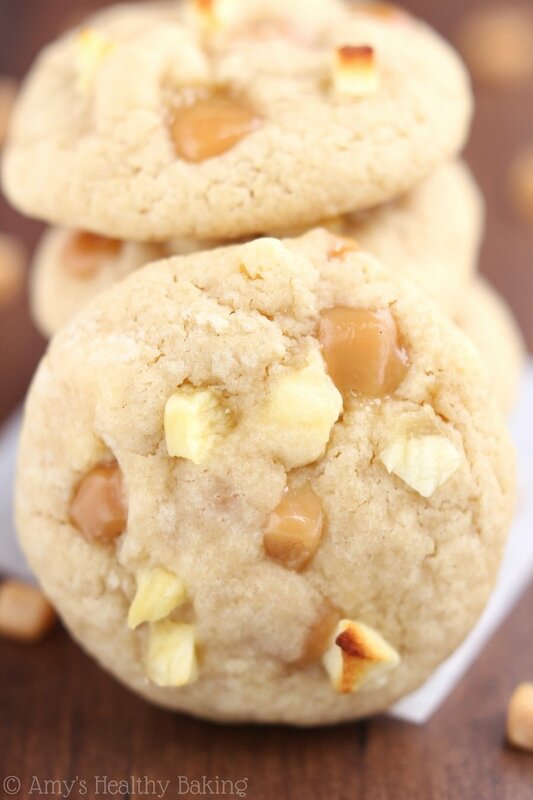 An easy recipe for soft and chewy cookies that taste just like a caramel-coated apple! Sweet, buttery & secretly skinny—but nobody will believe that! Back in January, my guy organized a huge card game tournament. Although actually hosted by the owner of the comic book and game store where he volunteers on Friday nights, that man lacked experience with planning this particular style of event, so all of the details fell to my guy instead. Throughout the fall, he had worked at similar tournaments hosted by other stores in Northern California, so he already knew what it took for the event to run smoothly. He advertised the date across social media, pre-registered players, and printed out all of the lists and materials. With a month to go, he recruited several friends to help him judge the games on the actual event date. After hearing his stories about the other tournaments, I knew the volunteers rarely received lunch at a reasonable hour. With too many last-minute players to register, seats to set up, and card decks to check, the events almost always started 30-60 minutes late, regardless of which store was hosting! So the night before, I practically emptied my flour canister baking scones, two types of muffins, and three flavors of cookies to keep the judges’ stomachs full and satisfied. Although half of the muffins returned home with my guy—his six friends all grabbed breakfast on their drive over—they polished off all four dozen cookies in just five hours! This past weekend, my guy organized another tournament, and with many of his same friends volunteering, I assumed they’d expect cookies at this one too. One of his friends only agreed under the (somewhat joking) condition that my baked goodies would be there! A few days before, I started brainstorming different flavors to try. 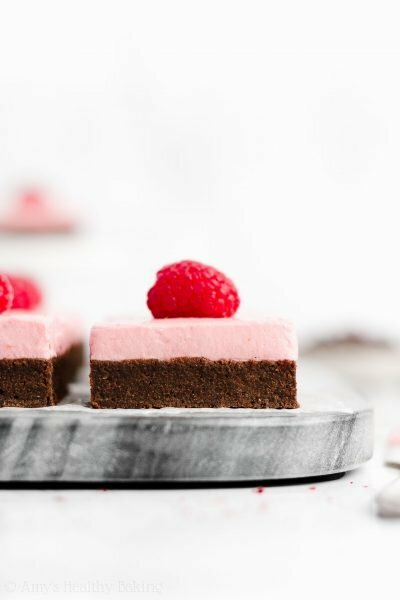 As a food blogger, I can never pass by the opportunity to make something new when I know I won’t have any leftovers sitting on the counter to tempt me! Although a few ideas floated around my head, I asked my guy if he had any thoughts before writing down recipes. After a few moments, he replied, “Caramel apple!” and was so excited about it that he immediately dashed out to the store—at midnight—to buy the ingredients for me. 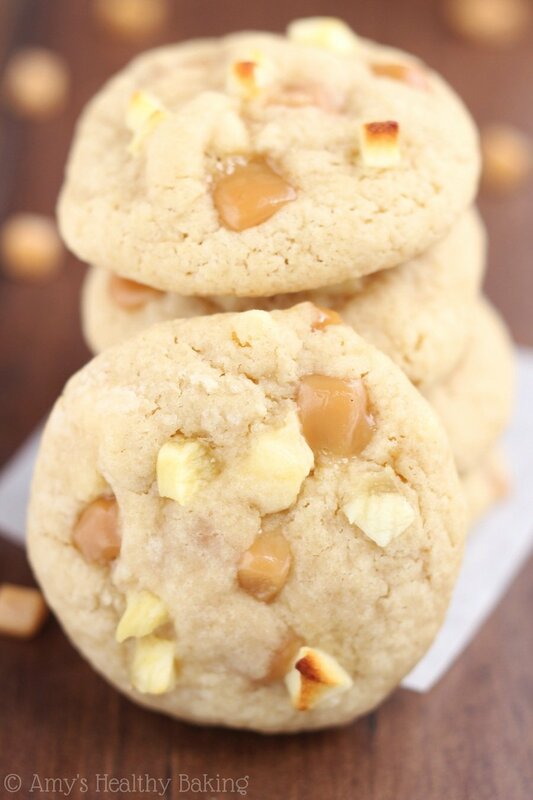 So here they are… My guy’s Caramel Apple Cookies! 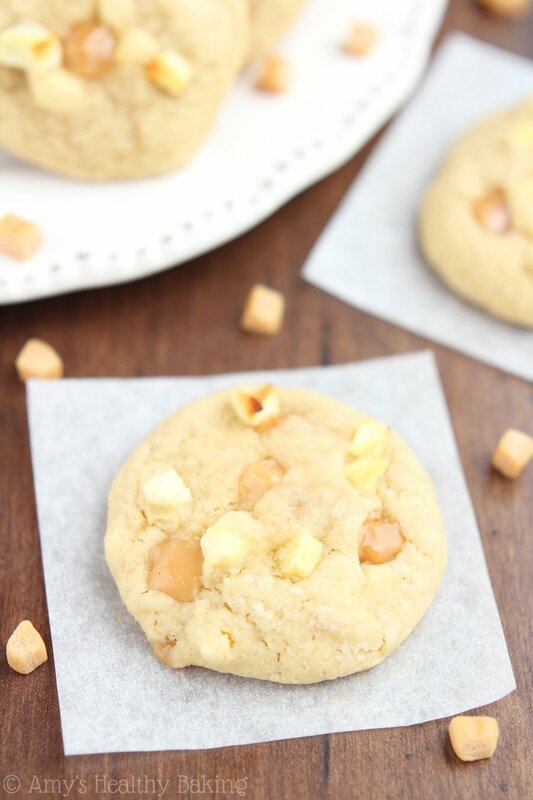 Inspired by our favorite treat from Disneyland, these buttery pillows of goodness taste fun and familiar with their chewy fruit tidbits and sweet melty nuggets of caramel. 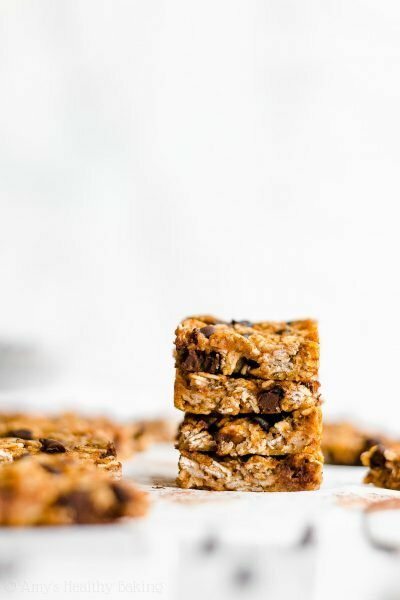 When you sink your teeth into these soft cookies, you’ll never believe they’re low fat and low calorie—they taste just as indulgent as a regular buttery recipe! I started with my favorite cookie dough base from my Ultimate Healthy Soft & Chewy Chocolate Chip Cookies. 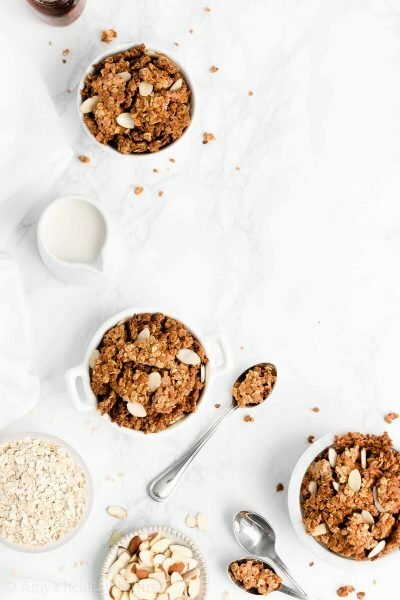 Many of you have tried it already and agree… With their buttery flavor and chewy texture, nobody can tell they’re lightened up! Brown Sugar. It adds extra moisture and chewiness! 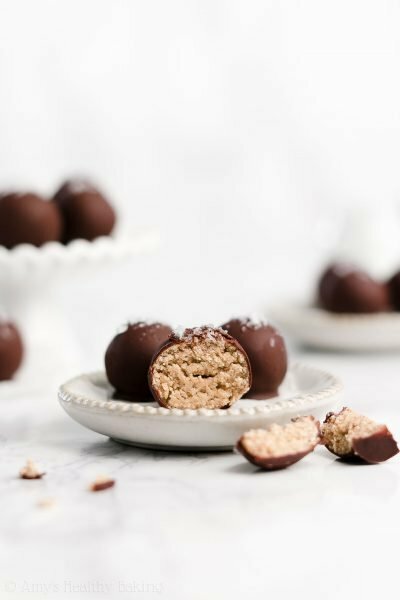 Brown sugar also contributes a faint caramel flavor, which really enhances the sweet tidbits in this recipe. Both light and dark will work, although I generally prefer light. Cornstarch. Typically stirred into soups and stews to absorb moisture and thicken them, it does the same thing in cookies. 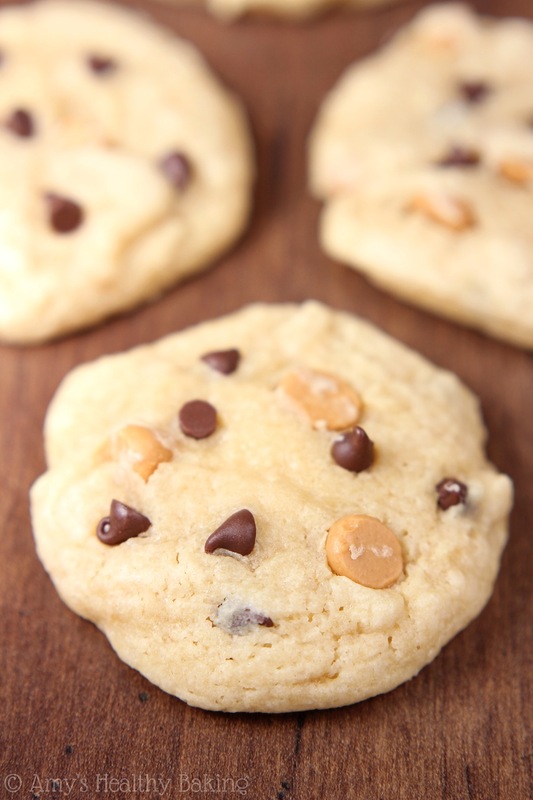 Cornstarch traps the moisture in the dough, which helps keep the cookies unbelievably soft. Extra Vanilla Extract. I measure out more than the average recipe because extra vanilla imitates butter’s flavor without all of the fat and calories. 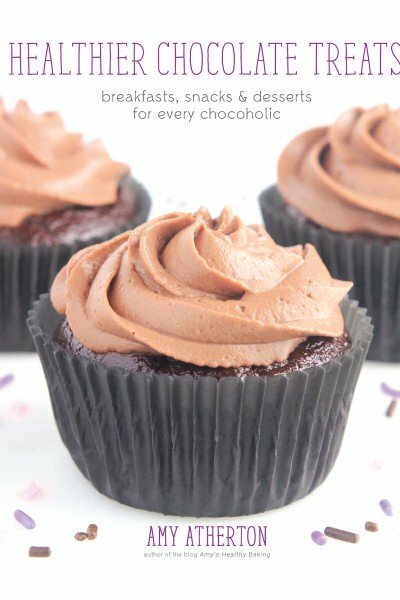 That little trick works really well in muffins and cupcakes too! For the mix-ins, it’s really important to dice them finely. 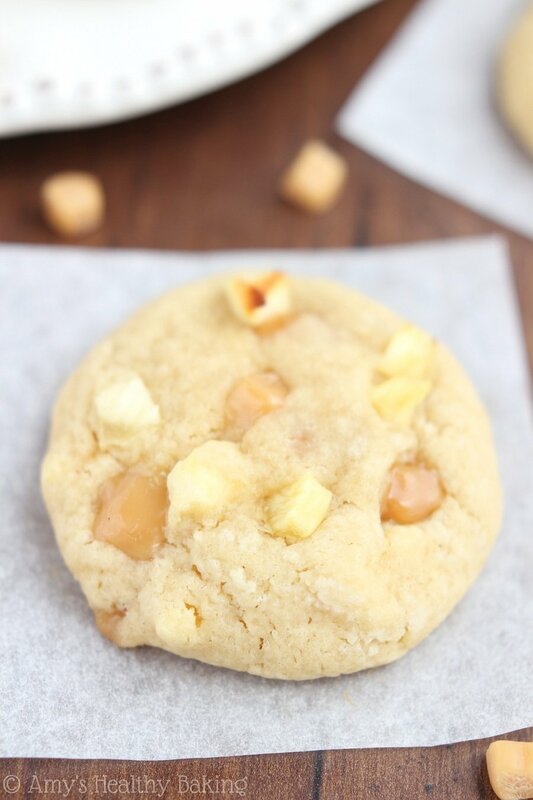 The smaller pieces ensure that you get one in every bite, and believe me, it’s really disappointing to only taste a single little nibble of caramel per cookie. When dropping the cookie dough onto the baking sheet, try to make sure none of the caramel nuggets on the bottom are exposed. They sometimes tend to stick to the parchment paper, and I don’t want you to miss out on any of that sweet candy! My last secret to extra soft and chewy cookies: Underbake them! Leave the dough in the oven for a brief 10-12 minutes. They’ll look and feel underdone when you pull them out, but the centers continue to cook through on the warm baking sheet as they cool without the outsides turning crisp and crunchy. Baked this way, the cookies stay soft for an entire week—if they last that long! 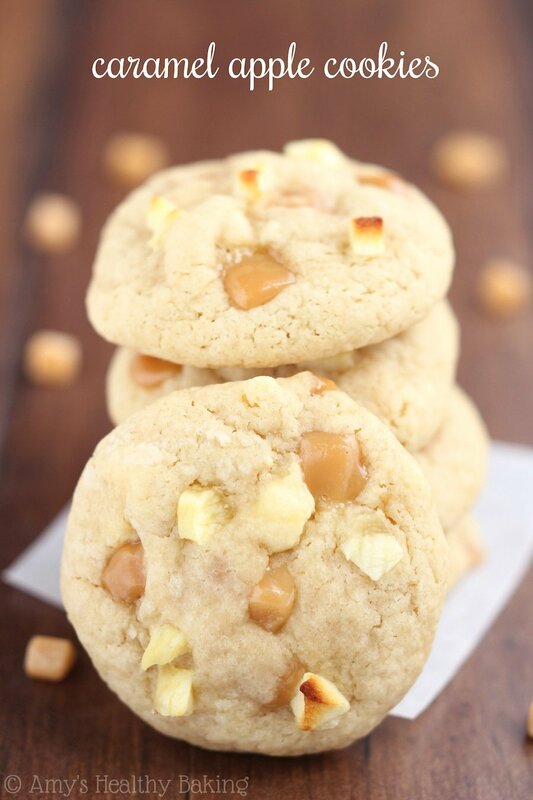 With their gooey golden morsels and tender fruit tidbits, these Caramel Apple Cookies taste just like your favorite fair treat—sweet and sticky and oh so addictive—just turned into soft and chewy cookies. 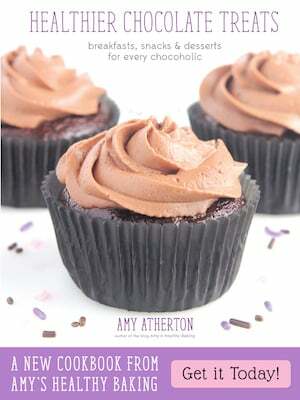 Even better, they’re a lot easier and much less messy to make! When I stopped by the tournament on Saturday afternoon, almost all of the judges agreed that these were their favorites. The entire batch had basically disappeared before lunch, and only a few tiny crumbs remained! Ready to bake your own? 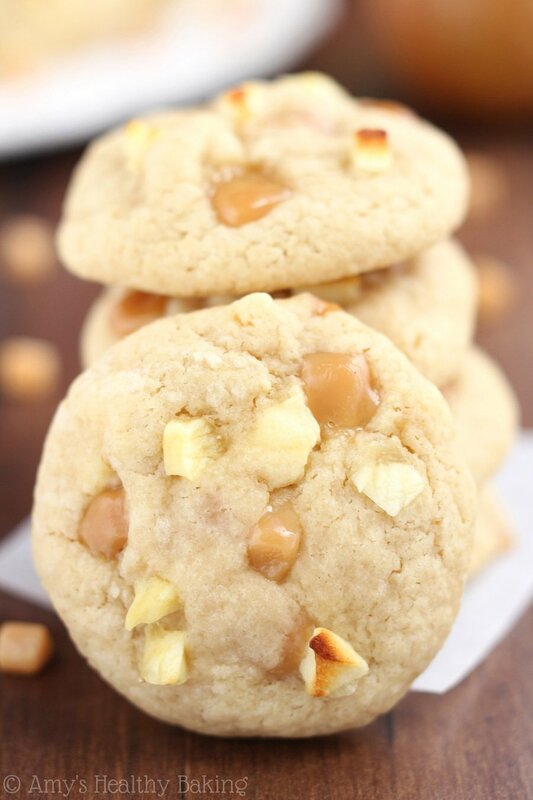 These soft and chewy cookies taste just like a caramel-coated apple! And they’re much easier and a lot less messy to make. Store any leftovers at room temperature in an airtight container for up to a week. Preheat the oven to 350°F, and line a baking sheet with parchment paper or a Silpat. In a medium bowl, whisk together the flour, baking powder, cornstarch, and salt. In a separate bowl, whisk together the butter, egg, and vanilla. Stir in the brown sugar, smearing out any clumps along the side of the bowl. Add in the flour mixture, stirring just until incorporated. 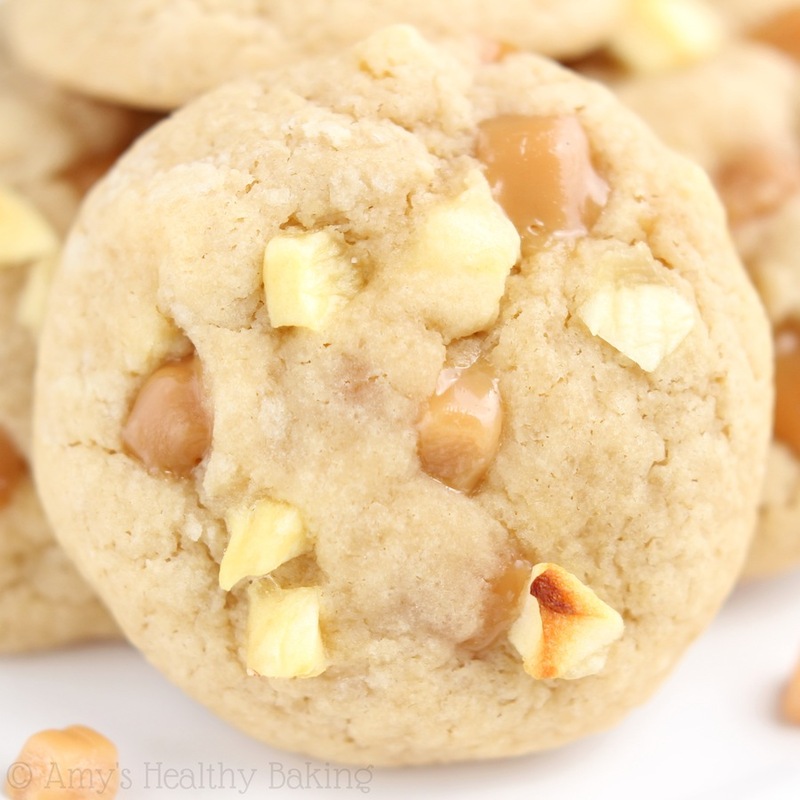 Reserve about 1/3 of the diced apples and caramels, and fold the rest into the cookie dough. Drop the cookie dough into 12 rounded scoops onto the prepared baking sheet. 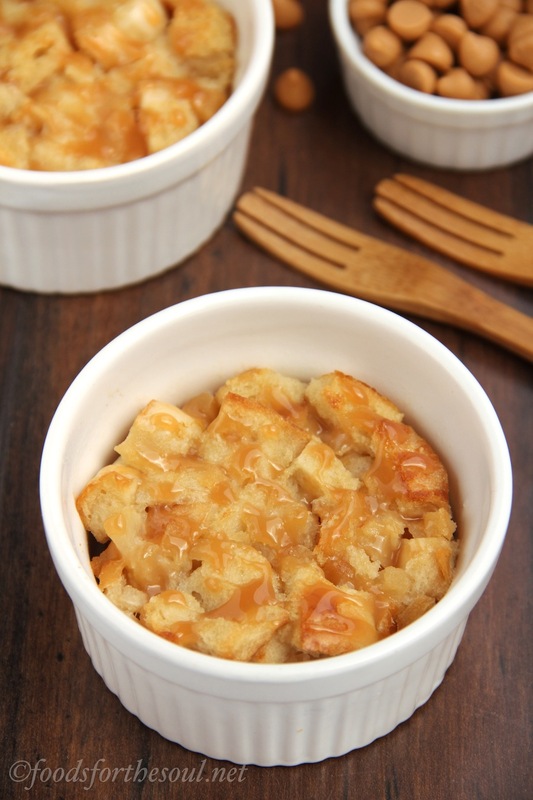 Press the reserved diced apples and caramels into the tops, and flatten slightly. Bake at 350°F for 10-12 minutes. Cool on the pan for 10 minutes before turning out on to a wire rack. Notes: It’s important to dice the caramels rather finely because this ensures every bite contains a little. It’s rather disappointing to only have 1 or 2 nuggets of caramel per cookie, so cutting them smaller prevents that! The cookies should look and feel underdone when you pull them out of the oven. 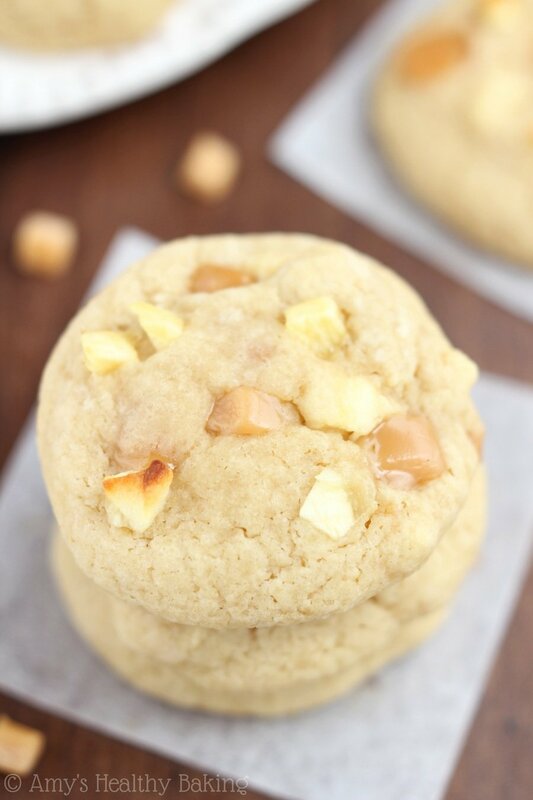 The centers will continue to cook on the warm baking sheet as they cool, and this ensures the cookies stay soft and chewy for an entire week. how do you make dried apples? I just bought mine from the grocery store Emma! All stores in my area sell dried apples in the dried fruit section. I hope you enjoy the cookies! 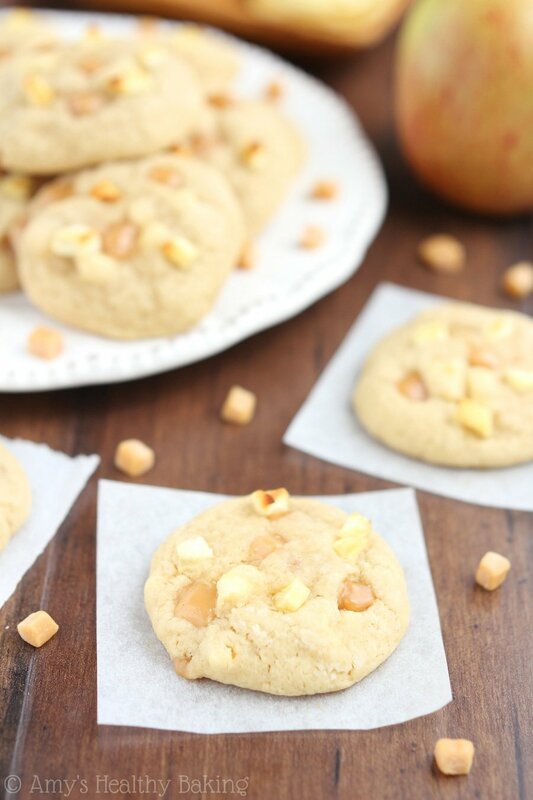 do you think these could be made with fresh apples? I’m trying to use up the rest of a bushel. Yes, fresh apples should work. I hope you enjoy the cookies Jamie! 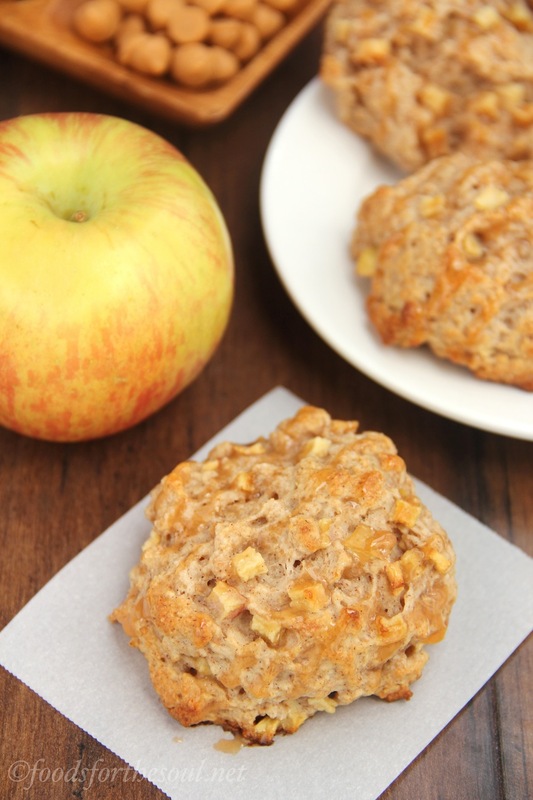 Could you use freeze dried apples? Yes, that should work. I hope you enjoy the cookies Tami! 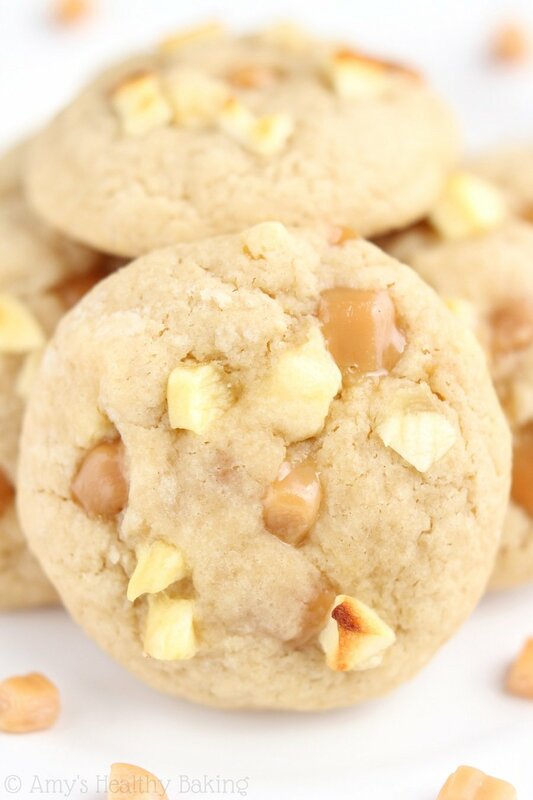 Can you add cornstarch to any cookie recipe to get that softness without it affecting the rest of the recipe? If so, what’s your rule of thumb for the amount? It’s not always possible to add cornstarch to any recipe (and not always necessary either! ), so I recommend following any recipe as written before tweaking it to understand what the texture of the original cookies is first. I’d stick with 1-2 teaspoons at most when adding cornstarch to a cookie recipe that doesn’t originally call for it. I think that should work Moni! 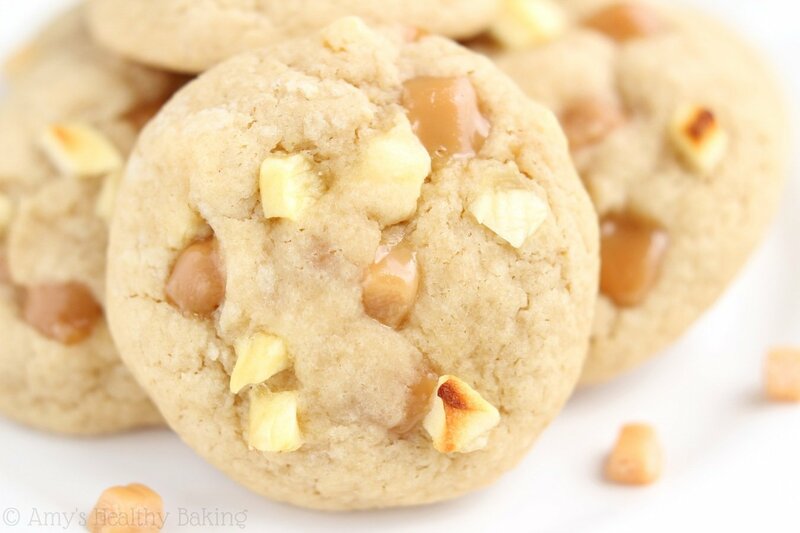 I’d suggest thawing the frozen apple pieces and patting them dry before adding them to the cookie dough to minimize any extra moisture. I’m excited to hear what you and your friends think of the cookies!